This topic provides an overview of how to use Debugger Data Model C++ Interfaces to extend and customize the capabilities of the debugger. To illustrate the goals of the debugger data model, consider this traditional debugger command. The debugger command is using a binary mask and it provides text only output in non-standard ways. The text output is difficult to consume, format, or extend and the layout is specific to this command. Contrast this to the debugger data model dx (Display Debugger Object Model Expression) command. This command uses a standard data model that is discoverable, extensible and composable in uniform ways. Logically name spacing things and extending on specific objects allows for the discovery of debugger extension functionality. Because the Data Model C++ Object interfaces can be very verbose to implement a full C++ helper library for the data model which uses a full C++ exception and template programming paradigm is recommended. For more information, see Using the DbgModelClientEx Library later in this topic. 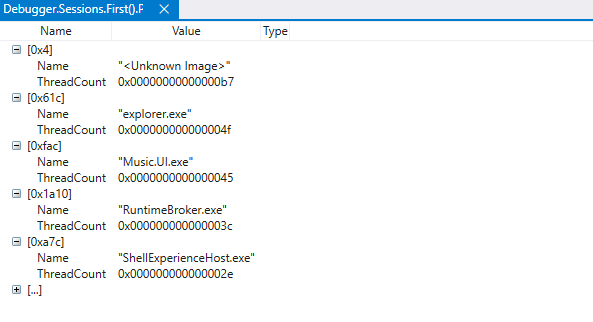 The data model is the way that the new WinDbg Preview debugger, shows most things. Many elements in the new UI can be queried, extended, or scripted, because they are powered by the data model. 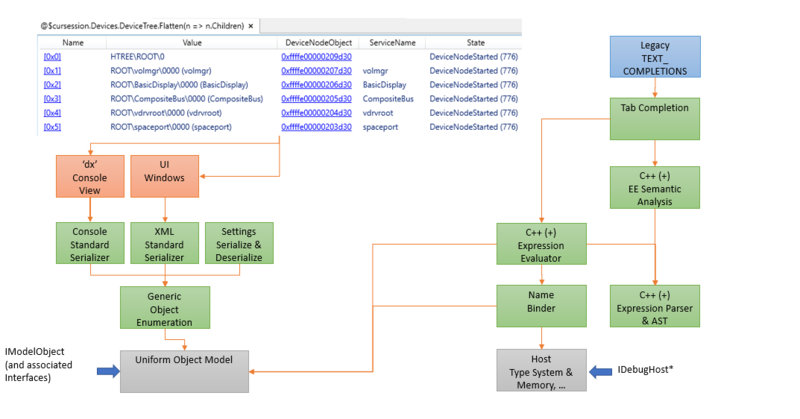 For more information, see WinDbg Preview - Data Model. The following diagram summarizes the major elements of the debugger data model architecture. To the left side, UI elements are shown that provide access to the objects and support such functionality as LINQ queries. At the center of the Debugger Data Model is a uniform object representation in which everything is an instance of the IModelObject interface. While such an object may represent an intrinsic (e.g. : an integer value) or another data model interface, it often represents a dynamic object – a dictionary of key/value/metadata tuples and a set of concepts which describe abstract behaviors. 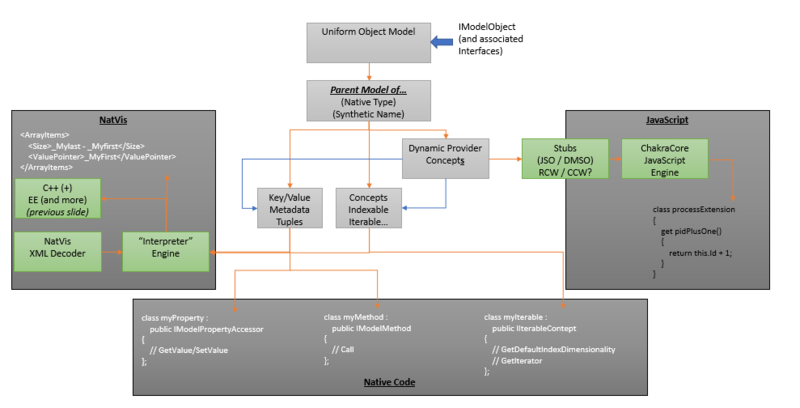 This diagram shows how the IModelObject uses Key Stores to contain values that a provider can create, register and manipulate. On the left it shows the IModelObject, that is the common object model that is used to manipulate objects. In the center is the Key Store that is used to store and access values. At the bottom it shows Concepts that support objects with functionality such as the ability to convert to a displayable string or be indexed. The next diagram shows a consumer view of the data model. In the example the dx (Display Debugger Object Model Expression) command is being used to query information. The Dx command communicates through a serializer to the object enumeration interface. IDebugHost* objects are used to gather information from the debugger engine. 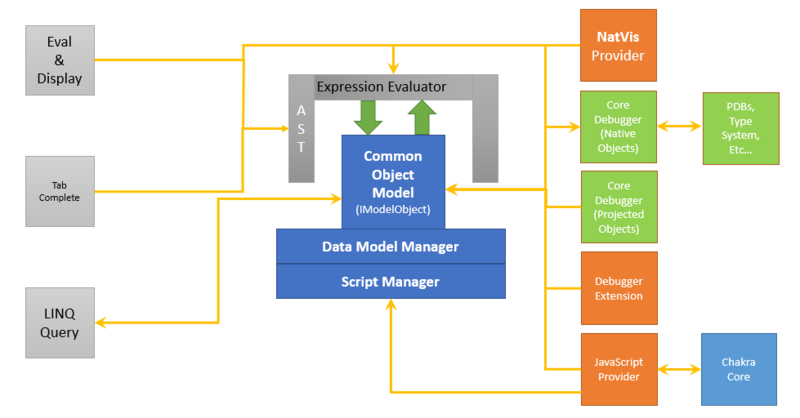 Expression and semantic evaluators are used to send the request to the debugger engine. This diagram shows a producer view of the data model. A NatVis provider is shown on the left that consumes XML that defines additional functionality. The bottom shows a native code provider that can also define additional functionality. This diagram shows the central role that the data model manager plays in the management of objects. 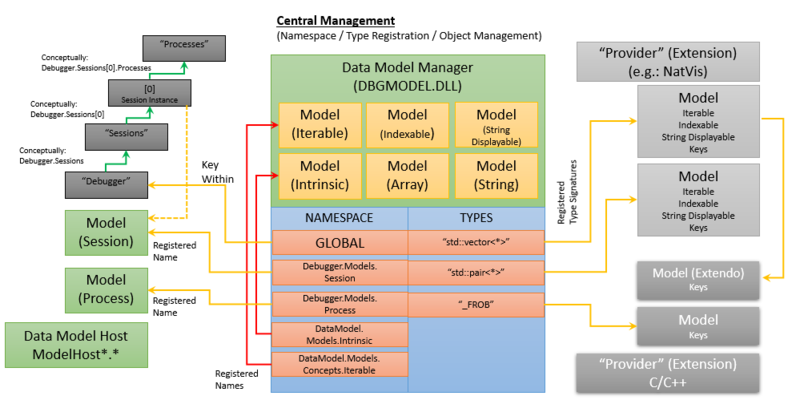 The Data Model Manager acts as a central registrar for all objects. On the left it shows how standard debugger elements such as sessions and process are registered. The namespace block shows the central registration list. The right side of the diagram shows two providers, one for NatVis on the top, and a C/C++ extension on the bottom. The Data Model Manager is the core component which manages how all extensibility occurs. It is the central repository of a set of tables which map both native types to extension points as well as synthetic constructs to extension points. In addition, it is the entity which is responsible for the boxing of objects (conversion of ordinal values or strings into IModelObject's). The Data Model also has a general notion of what a script is and how to debug one. It is entirely possible for a debugger extension to come along and define a general bridge between the data model and another dynamic language (usually a scripting environment). This set of interfaces is how that is accomplished as well as how a debugger UI can make use of such scripts. The Data Model C++ Object Interfaces to the data model can be very verbose to implement. While they allow for full manipulation of the data model, they require implementation of a number of small interfaces to extend the data model (e.g. : an IModelPropertyAccessor implementation for each dynamic fetchable property which is added). In addition to this, the HRESULT based programming model adds a significant amount of boiler plate code that is used for error checking. In order to minimize some of this work, there is a full C++ helper library for the data model which uses a full C++ exception and template programming paradigm. Use of this library allows for more concise code when consuming or extending the data model and is recommended. To see how the DbgModelClientEx library can be used, review the Data Model HelloWorld C++ sample here. HelloProvider.cpp - This is an implementation of a provider class which adds a new example property "Hello" to the debugger's notion of a process. SimpleIntroExtension.cpp - This is a simple debugger extension which adds a new example property "Hello" to the debugger's notion of a process. This extension is written against the Data Model C++17 Helper Library. It is far preferable to write extensions against this library rather than the raw COM ABI due to the volume (and complexity) of glue code which is required.